found a new spectroscopic line in gadolinite. was muddying tests of Mosander’s derivation from cerite. and named it for gadolinite after Johan Gadolin. Gadolinium make good shielding for nuclear reactors. Small amounts of gadolinium improves the workability of other metals. Gadopentetic acid is given intraveniously as an MRI contrast agent. Green gadolinium phosphors were used for color television tubes. The gadolinium yttrium garnet has various uses in optical equipment. The gadolinium gallium garnet is an imitation diamond. Gadolinium’s magnetocaloric effect makes magnetic refrigerators work. Gadolinium-153 emits gamma rays for testing bone density. You have no idea what this stuff does. Most people haven’t the vaguest notion. why should you even think of it? than diesel? Well, you just have no idea. 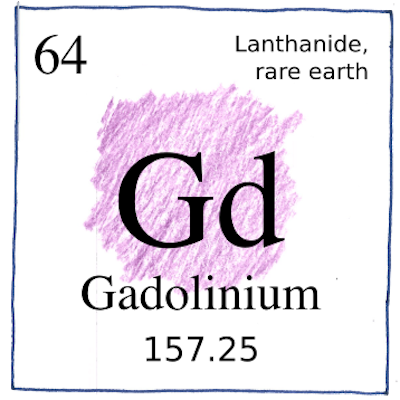 Gadolinite was named after Johan Gadolin who first isolated yttrium from the mineral. Gadolinium alloys demonstrate the magnetocaloric effect, whereby they operate in magnetic refrigerators. In a magnetic field, the metal heats up and loses the heat to the environment; when it leaves the field, it cools as its domains grab energy to reorient themselves.